Pairing a presynaptic activity with a postsynaptic activity results in long-term potentiation (LTP). 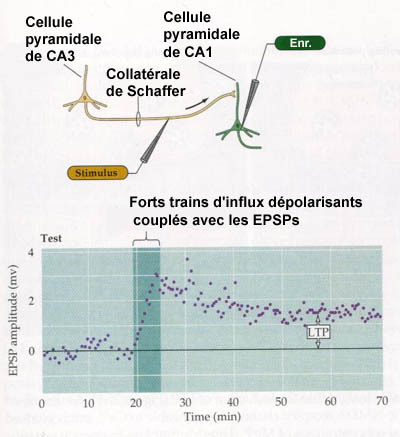 Applying a single stimulus to a Schaffer collateral pathway of the presynaptic neuron causes an excitatory postsynaptic potential (EPSP) in a pyramidal cell in the CA1 region, but does not cause any strengthening of the synaptic connection. However, if, at the same time as the Schaffer collateral pathway is stimulated in the presynaptic neuron, a current is injected via the recording electrode into the postsynaptic CA1 neuron to depolarize its membrane potential briefly; then the EPSPs in this neuron are strengthened for a prolonged period.